BLADE posts knife pictures on its Instagram account to highlight knifemakers’ work. Editor’s note: Follow BLADE on Instagram here. Also, anyone buying or selling knives online should take caution when doing so on a social media platform. Recent events have singled out “weapons” content, and Instagram (owned by Facebook) is likely to be no exception. Diversification is key. Remember: In-person knife shows are still the best bet for buying/selling safely and securely. A wave of Instagram commerce is building in the knife industry, and there is no indication of a slowdown at this point. Those who have leveraged the platform have seen increased activity that otherwise might have required hours and expenses associated with travel, marketing and promotion. 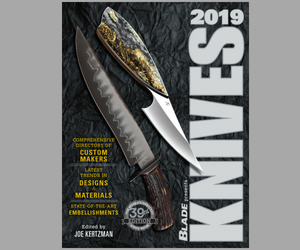 Purveyor Neil Ostroff of True North Knives started an Instagram account as a social tool to connect with friends, family and customers, but it soon became apparent that an additional sales tool was at his disposal. He changed his account from his personal name into the True North Knives (TNK) brand. He monitors how posts are received by the public, using the “View Insights” option for real-time metrics. Breed points out that advertising in most any format is expensive. Knife pictures posted on Instagram allow immediate access to potential buyers at virtually no cost. After seven or eight months on Instagram, Kim sees an unlimited future for the platform. Though social media is asserting itself in the TNK sales process, Ostroff is warily watching developments. His website is still king with his business at this point. Michael Zieba S1 Mini TNK Freedom Collection V2- Sprint Run. Bronze Skull Backspacer . Zieba Exclusive Bottle Opener. Patented Angel Wing- USPTO Reg #5,278,562 Link in bio for website. Another caution from Ostroff is that Instagram provides any seller with an “escape hatch” to sell a knife to anyone and not necessarily the first customer who steps up to buy. When a traditional e-commerce website operates, the item for sale is listed and directly connected to actual inventory; once it is sold it is gone and marked as out of stock. “Fair game for all!” he said. “Many knifemakers on Instagram are only offering their knives for sale by lottery or raffle. As I don’t buy knives from Instagram I feel sorry for the people who aren’t always ‘attached to’ their phones, and also don’t have the money to, in many cases, overpay for knives due to the hype,” Neil related. “Many knives are sold at grossly inflated prices by knifemakers who are merely looking for the quick buck with no regard for a potential secondary market”—a secondary market that will never come about when the initial/primary purchase price is way too high. Still, the luster of Instagram has drawn custom makers, purveyors and purchasers to the platform like moths to a flame. No, simply an assessment of the pros and cons of a growing medium in the knife industry, one that cannot be ignored and likely will never go away. However, the traditional opportunity to hold the real knife in your hand is diminished. Buying from knife pictures has its own risks. The situation is always improved when buyer and seller really know one another. Time will tell how Instagram truly changes the buying/selling process.